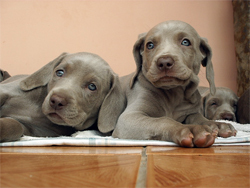 The Weimaraner is a silver gray versatile hunting dog. It has been sometimes called the "Ghost Dog" due to it's appearance. The Weimaraner is a young dog breed, dating back only to the early 19th century. This breed's short and smooth coat along with its unusual eyes give it a regal appearance different from any other breed. They are a fast and powerful dog while in the field, but are also very suitable in the home as a companion as well. The Weimaraner that we know today is the product of selective German breeding, coming from the same general stock which has produced a number of Germany's hunting breeds including the GSP. Early Weimaraners were used by royalty for hunting large game, such as boar, bears, deer, and foxes. 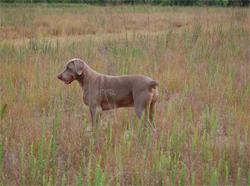 As the popularity of large game hunting began to decline, Weimaraners were used for hunting smaller animals, like upland birds, rabbits, foxes and other small game. Rather than having a specific purpose such as pointing or flushing, the Weimaraner is an all purpose gun dog. The Weimaraner is loyal and loving to his family, an incredible hunter, and a fearless guardian of his family and territory. The name comes from the Grand Duke of Weimar, Karl August, whose court enjoyed hunting. The Weimaraner was then known simply as the Weimer Pointer, its name deriving from the court by whom the breed was sponsored. 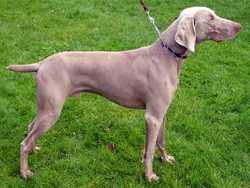 Additional breed information for the Weimaraner can be found at the American Kennel Club website.